Upon installation of one of our professional grade custom wired assemblies, you will notice an improvement in both clarity and character, coupled with more reliability. Not only is this is because we use only the finest components available, but also because we have been wiring guitars and basses for over 20 years and know how to make them sound great. Every component is hand picked for tolerance. Every pot treated with Caig D5. 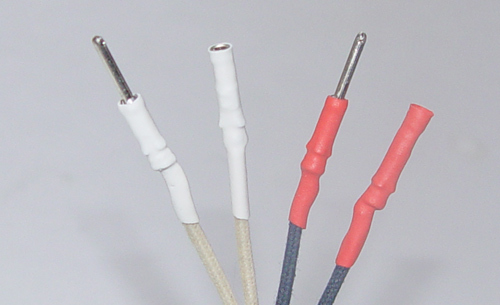 Every sensitive connection insulated with heat shrink. Every solder joint solid and shiny. Every assembly custom ordered, and never mass produced. Every unit tested extensively. 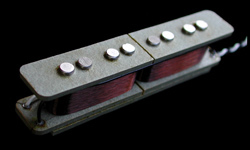 position 4: neck and bridge in series, yet out-of-phase (not hum-cancelling). This is a very unique and cool effect. The sound with be thinner and lower in volume. 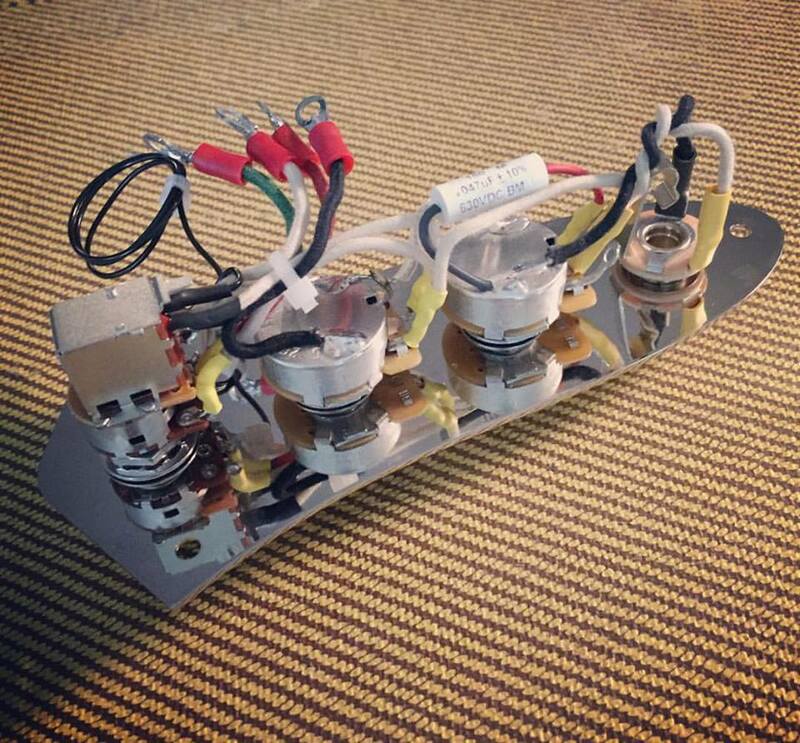 CHECK OUT SOME SOUND SAMPLES OF THE JX5 WIRING HARNESS!! This is a very cool way to switch between the classic j-bass sound featuring both pickup in parallel, or the more punchy p-bass sound featuring both pickups in series. This is our most popular offering. Stock Wiring - Good old fashioned stock wiring! 5 62J 1962 Jazz Bass Wiring - This configuration come with 2 concentric/stacked pots: Each one controlling volume and tone of an individual pickup. 6 BLEND_62 Blend mod for 1962 Jazz Bass (or any other 2 pickup instrument) - With this configuration the 1st pot is a balance/blend pot with center detent that allows you to blend in the 2 pickups and the 2nd pot is a concentric/stacked pot to function as a master volume and tone. Rothstein Guitars is an AUTHORIZED DEALER for all these manufacturers listed on this page which means any pickups you purchase purchase from us carries the full manufacturer's warranty. LINDY FRALIN PICKUPS- We love Lindy's J-Bass pickups. They come as close to the pre-CBS Fender sound as you can find. We're talking amazing bite and growl!! We have installed them in countless basses and what is rather amazing is how consistently good they sound. They are wound by hand by Lindy and his staff in Richmond, VA.
CURTIS NOVAK PICKUPS- If you're looking for the highest quality hand-wound "boutique" pickups then check out Curtis Novak. Curt has been hand winding pickups for 20 years and has studied the methods of the masters. He is quite adept at "scatterwinding" which many feel is one of the secrets to great tone. He offer a traditional J style pickup which are dead-on replicas of pre-CBS Fender J pickups, as well as a hum-cancelling "split" J pickup. MCNELLY PICKUPS- Top notch hand wound pickups.McNelly's Tradiational Jazz Bass pickups and single coil, and capture that early J-Bass tone that's full and punchy with great string definition. The bridge is wound slightly higher than stock making it more usable on it's own. His noiseless model is based sonically on the standard J set, but are split for noise cancelling. They fit under the same style covers and look identical when installed. JOE BARDEN PICKUPS- These are really something special and totally noiseless too. 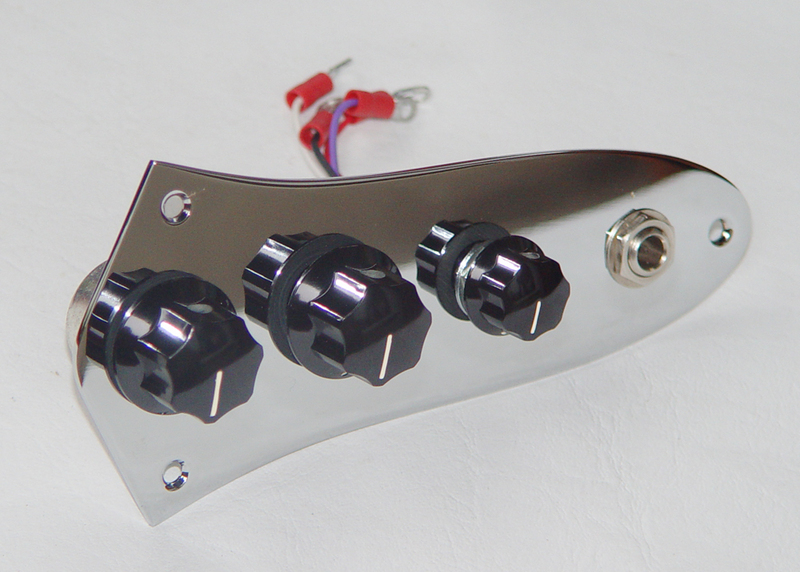 You now can take advantage of the famous Joe Barden double blade design for your J-bass. These have remarkable tone, clarity, power, and responsiveness. Designed to maintain authentic J-Bass tone and character but with extended frequency response and articulation that characterizes all Joe Barden pickups. 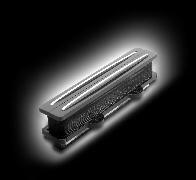 Like all other Joe Barden pickups, the J-Style pickups exhibit quiet performance for live performance or recording. NJ4 - Pure and classic true single coil pickup for those that are seeking a great vintage tone and traditional design. The NJ4s are a great all-around pickup for all music genres and playing styles. NJ4SV - A hum-canceling split-coil jazz pickup, the SVs deliver that classic single coil tone but without the noise and 60 cycle hum that plague most true single coil designs. This set is tonally as close as you can get to being a clone of the original NJ4 single coil. The SVs are very even and balanced from top to bottom and deliver classic, instantly recognizable tones with sweet highs, punchy mids, and rich lows. 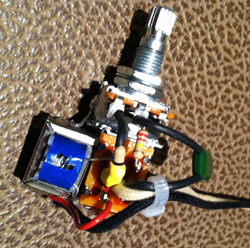 NJ4SE - Like the NJ4SV, this is a split coil hum cancelling design. 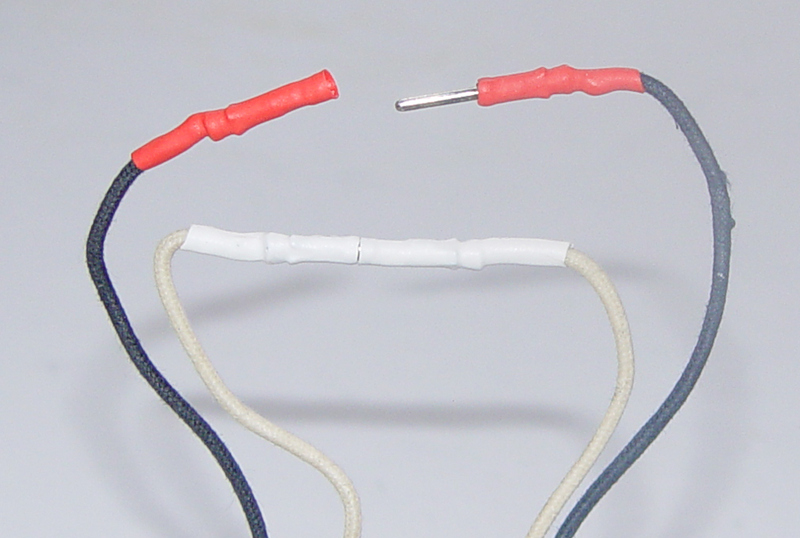 They use the same hand wound pattern found on the NJ4's but with the finer 43 gauge enamel wire. The natural character of this design is to have more pronounced lower mids, and an ever so slightly muted high end. This makes them ideal for fingerstryle players that are going for a solo bridge pickup sound with good 'bark' and 'heft'. They are also totally hum cancelling!! 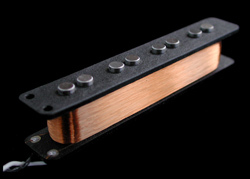 Pickup length: Bridge = 3.725", Neck = 3.600"
NJ5 - Five string single coil pickups in the same style as the NJ4. NJ5S - These are a split coil hum cancelling design. This pickup is designed to have a tone as close as possible to a true single coil. NJ5F - These are Fender Jazz 5® replacement pickups. They will fit into your existing covers and make your 5 string come to life. They are based on the same formula that makes my NJ4 pickups sound so good: Alnico V magnets and Heavy Formvar 42 gauge wire wound in a simulated hand pattern. NJ5FS - Hum-cancelling, Split coil version of NJ5F. DIMARZIO - DiMarzio is a fine USA company located in Staten Island New York. DiMarzio has been around for a very long time and practically invented the after market pickup space. Engineer Steve Blucher is world renowned for innovative pickup designs. We really like the hum-canceling Area J set which provides excellent output and a very strong midrange punch. We also like the Model J set and offer this as an option as well. STANDARD TONE CONTROL UPGRADES - you may select between SBE Orange Drop capacitors (no extra charge), or for an up charge Alessandro High End vintage repro wax and paper capacitors, Vitamin Q Paper & Oil capacitors, or the ultra high quality V-Cap TFTF Teflon® Film and Foil capacitors. The price will vary depending upon which capacitor you select. 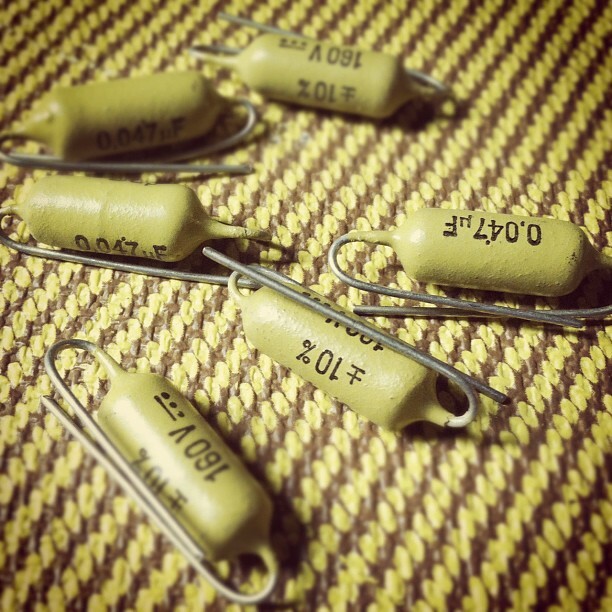 Read about capacitor choices here. 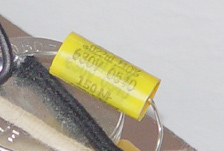 We recently scored some NOS .047 uf Mullard Mustard capacitors which you may order as an option with your prewired assemlby. These are great sounding capacitors. We have a very limited supply of these as they are no longer made. When the push-pull switch is down this functions as a standard tone control which cuts highs. When the switch is in the up position it becomes a mid-sucker that scoops mids as you turn the knob down which works great for slapping. NOTE: This tone option is NOT available for the 62 Jazz Bass wiring configurations listed above. The second time the same phrase is played in full bass mode. In other words, the push-pull switch is in the "down" position and the tone knob is rolled almost all the way down (to about 1). The third time the phrase is played in mid-cut mode and you will notice how the slaps and pops really jump out. 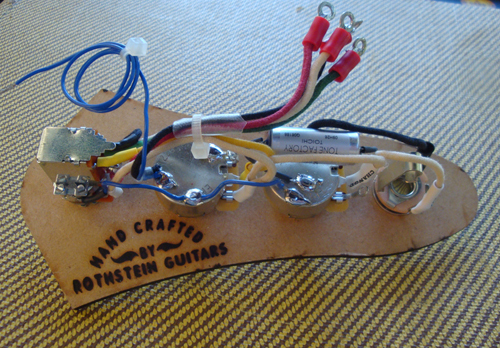 To arrive at this setting, the push-pull switch is in the "up" positino and the tone knob is rolled almost all the way down (to about 1). Choose between 250K and 500K. 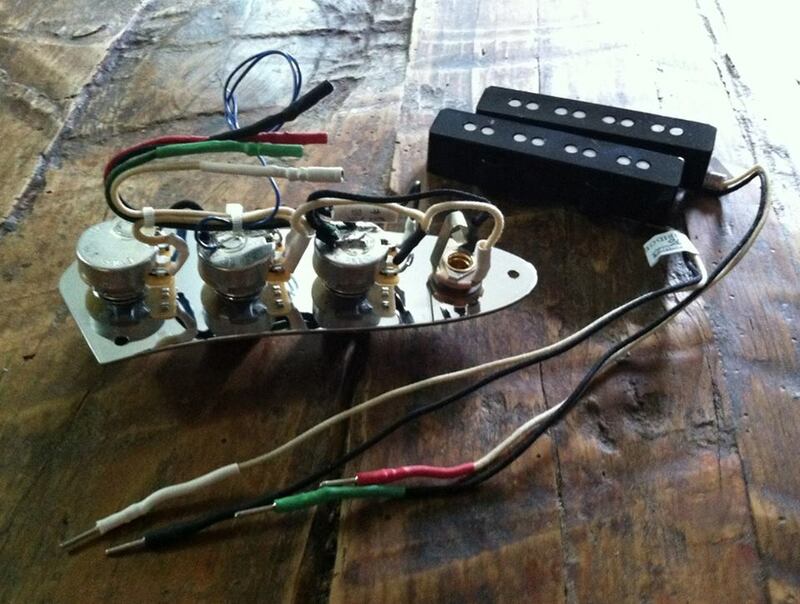 For most pickups 250K pots will work best, however you may want to try 500K pots for a brighter tone, usually appropriate for hotter or overwound pickups which can use the extra highs. We use only the highest quality pots money can buy. All pots are tested and treated with Caig DeOxit for long trouble free use. Please note: If selecting the Mid-Scoop/Tone switch (above), the tone pot will always be 500K. 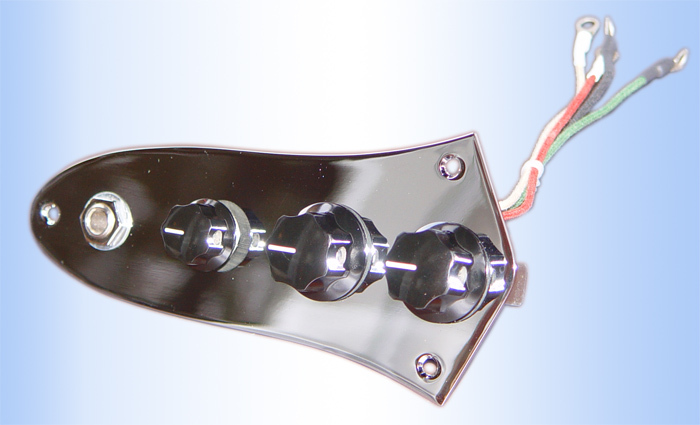 Each assembly optionally comes with a high quality control plate and/or vintage style plastic black knobs if you wish. If you want to use your own knobs, make sure they are the kind of knobs which are tightened with a "set-screw" (as opposed to the push-on knobs). NOTE: All of our wiring configurations use a 3 hole control plate, excelt our 1962 offerings,which come with a 3 hole control plate. Special Note about JX5 Fit - On most J-basses the JX5 will drop in pretty easily, and other J-basses it will be a tight fit and might require a little "fussing" to get it to fit. If you are uncomfortable with the process, we recommend you bring the JX5 to a qualified luthier for installation as this will be a very simple task for a good tech. We are now offering you a solderless option when purchasing prewired J assemblies with pickups for a $35 upcharge. 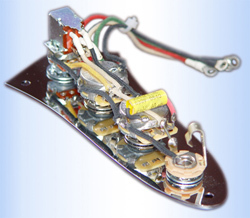 The prewired bass assemblies described on this page are entirely PASSIVE, meaning no battery is required. To view our active offerings, click here. James Jamerson -- Early 60's P bass. Geddy Lee - "Rush" - Rickenbacker 4001 and Fender Jazz bass. A common myth regarding passive circuitry is that you somehow get short changed because you may perceive a larger variety of tonal options out of active preamps. This is false. We have listed 10 great tonal variations you can get passively without any batteries. If you haven't played around with these you are missing something good. Coil Cut (for humbuckers) - short one coil of a humbucker commonly referred to as a "coil tap"
Experiment with Potentiometer Values - Do you need a brighter tone, try 500K or even 1 Meg pots. When I found your site I was looking for a volume/pan/tone assembly like your JBB unit. However after browsing through your very informative web site and studying the various options, the JX5 looked like it would not only do what I wanted, but might also offer some additional tonal versatility. The sound clips on your site convinced me to give the JX5 a try, so I ordered one five days ago. The JX5 assembly arrived today -- I was very impressed with the fast turnaround! The unit was very well packaged and the instructions were exceptionally clear and easy to follow and it only took me 15 minutes to install (including the time it took to find the proper screwdriver and my elusive soldering gun). 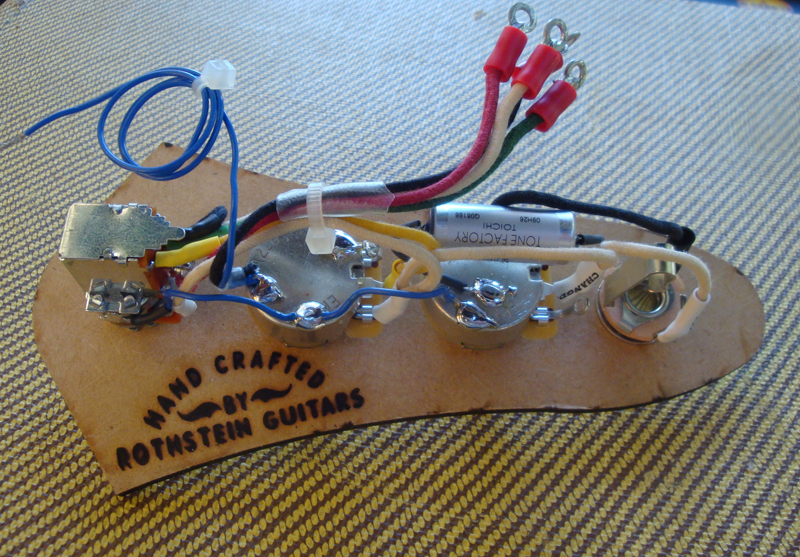 having a quicker, easier way of combining pickup signals than fiddling with two volume knobs. However, in the #3 position it thumps like a P bass (just like your web site says) and at #4 I get a bright, funky sound that I swear sounds like a vintage Rickenbacker. For the very reasonable price of your JX5 unit I feel like I am getting three basses in one! You have a very well-designed, easy to use and informative web site, fast order fulfillment, concise, well-illustrated installation instructions, and an outstanding, high quality product. Thank you -- I couldn't be happier! I had heard about your prewired harnesses on various bulletin boards and decided to try one for a Jazz Bass Project I was building called The Dream Jazz Bass ... not only was I pleasantly surprised at the outcome, quality of merchandise and overall customer service, but so was the luthier who assembled my bass - he actually told me that he was considering not giving me the bass, and instead, would make me an offer to buy it! 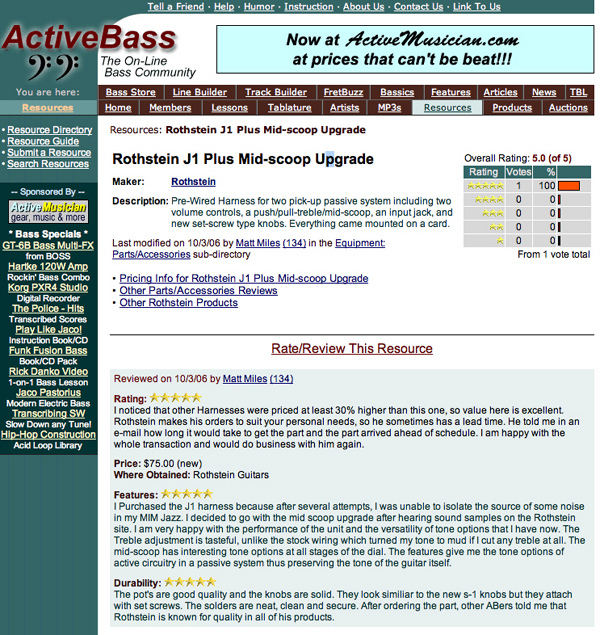 All this was possible because of the attention to detail that Rothstein Guitars put into their product and pickup matching recommendation(s) ... I recommend them highly and with my network of musicians in the Southeastern US, that is a whole mess of guitar and bass players ... great job and keep up the fantastic work!" Francis Hernandez, from the band "He's Dead Jim"
FENDER®, J-BASS®, and JAZZ BASS® are registered trademarks of FMIC. All rights reserved. The author has no affiliation with FMIC.